12th century icon of St Nicholas from Constantinople. The 15th century marble side altar dedicated to the Virgin. Relics of Catholic priests executed because they refused to convert to Protenstanism. Buses 86, N04, N05, N06, N08, N09, N10, N11, N12, N13, N16 stop Bourse. Trams 3, 4, 32 stop Bourse. Subway 1, 5 stop De Brouckere. How popular is St. Nicholas Church? People normally club together Oceade and Villa Empain while planning their visit to St. Nicholas Church. Beautiful church near the Grand Place. 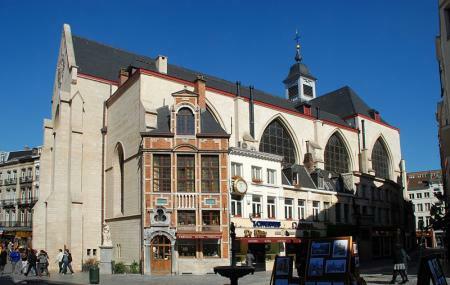 The church of Saint Nicolas of Brussels , built around 1125 , is one of the first four churches of the city of Brussels and best preserved in its successive developments. Being close to the Palais de la Bourse , it is commonly called Saint-Nicolas de la Bourse . Beautiful old gothic Roman Catholic church near Grand Place in Brussels, Belgium. One of the several that still celebrate Mass.